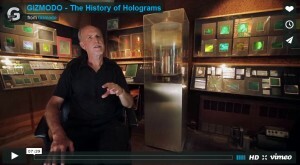 Listen to Jason Arthur Sapan talk about the history of holography on GIZMODO. To fully understand the history of holography you need to have a basic idea of what a hologram is. Light is an electromagnetic wave. Holography uses the wave nature of light. Unlike a normal photograph that uses a lens to focus an image on an electronic chip or a piece of film and simply records where there is light or no light, holography is a photographic technique that records the shape a light wave takes after it bounces off an object, much like the impression you would see if a key were pressed into clay. It uses interfering waves of light to capture images that can be fully three dimensional. When waves of light meet they interfere in the same way waves of water interfere to make the kind of patterns you see when you throw rocks into a pond. It is the information in this type of wave pattern that is used to make holograms. It wasn’t until the invention of the LASER that true three dimensional holograms as you see today became a practical reality. A laser creates pure waves of light that march in phase like a marching band. These waves are said to be coherent. A coherent light makes it possible to record the light wave interference patterns of holography. Albert Einstein first theorized about the process which makes lasers possible called “Stimulated Emission” in 1917. The idea of the laser was first published in 1958 by Arthur Shawlow and Charles Townes who were working at Bell Labs in Murray Hill, NJ. Theodore Maiman built the first working ruby laser in 1960 while working at Hughes Research Laboratories in Mailbu, California. This was closely followed by Ali Javan who invented the first gas laser, the Helium-Neon laser in December 1960 at Bell Labs. In 1963, Robert Hall, invented the semiconductor injection laser, known today as laser diodes, while working for General Electric laboratories in Schenectady, New York. However, in 1977, the US Patent Office awarded the basic patent for the laser to Gordon Gould, a doctoral student at Columbia University under Charles Townes, based on his idea from 1957. He didn’t apply for a patent until 1959 on bad legal advice, but after 20 years of court cases he ultimately prevailed. He was the first person to coin the word LASER, which stands for Light Amplification by Stimulated Emission of Radiation. Holography came into being long before the laser was invented. Back in 1886 in France, Gabriel Lippmann developed a theory of using light wave interference to capture color in photography. He coated mercury on the back side of glass photographic plates to act as a mirror and bounce the light waves back through the emulsion and create wave interference. In 1891 he presented this theory along with some primitive examples of his interference color photographs to the Academy of Sciences. He was able to present perfect color photographs made by the Lumière brothers to the Academy in 1893. It was in 1894 that he published his complete theory. Lippmann won a Nobel Prize for Physics in 1908 based on this work. While head of the Physics Department at the Sorbonne, Lippmann was the thesis adviser to a Polish woman named Maria Sklodowska allowing her to use his lab for her work. He was so impressed that he introduced her to one of his best students, Pierre Curie, whom she later married. Marie Curie went on to become the first woman to win the Nobel Prize in Physics in 1903 along with her husband and Professor Antoine Henri Becquerel only two years after the Nobel Foundation was established, for their joint research on the radiation phenomena, and later in 1911 she won the Nobel Prize in Chemistry for her discovery of radium and polonium. Like Einstein who did poorly at times in school and Edison, who was considered addle headed by his teacher and taken out of school, Lippmann had not been an outstanding student. He had neglected work that did not interest him. In fact, he failed the examination that would have qualified him as a teacher. Lippmann’s wave interference color photographs were the the predecessor to holograms. There were no color dies. The colors were the result of the diffraction of light into its primary colors. In order to see the images you would have to hold the film at just the right angle to the light in a similar manner to holograms. In 1915, at the age of 15, Dennis Gabor, a Hungarian, became interested in physics having studied the work of Gabriel Lippmann. Like Lippmann, Gabor was Jewish. In 1933, with Hitler’s rise to power, Gabor had to flee to England to escape the religious persecution of the Nazis. Once in England he worked at British Thompson-Houston Research Laboratories in Rugby. While attempting to improve the resolving power of the electron microscope to make it capable to see single atoms, he serendipitously came upon his theory of wavefront reconstruction. He named it holography based on the Greek words holos for whole and graphe for message. In 1971, Gabor was awarded the Nobel Prize in Physics for his theory of holography. In the former Soviet Union, Yuri Denisyuk had read Lippmann’s description of interference photography and realized it could be used to record three dimensional images. He began his experiments in 1958 using a highly filtered mercury discharge tube as his light source, since the laser did not yet exist. He published his work in 1962 and received scathing reviews in the Soviet Union. But these were the first three dimensional reflection holograms. Denisyuk did not know of Gabor’s work. In our conversations, Denisyuk told me that his superiors held him in extremely low esteem and did not believe in his work in holography. Things changed for him when a visiting delegation of American scientists asked to meet him. After they saw that his work was valued in the West, his fortunes rose dramatically, and he was given a new lab and thereafter held in high regard. Emmett Leith, while working on a top secret radar research project in 1958 independently reinvented holography, never having heard of Gabor. His work was not published until 1961. With the invention of the Helium-neon laser, he and his assistant Juris Upatniks introduced their work in three dimensional laser transmission holography to the public. They did not know of the work of Denisyuk.